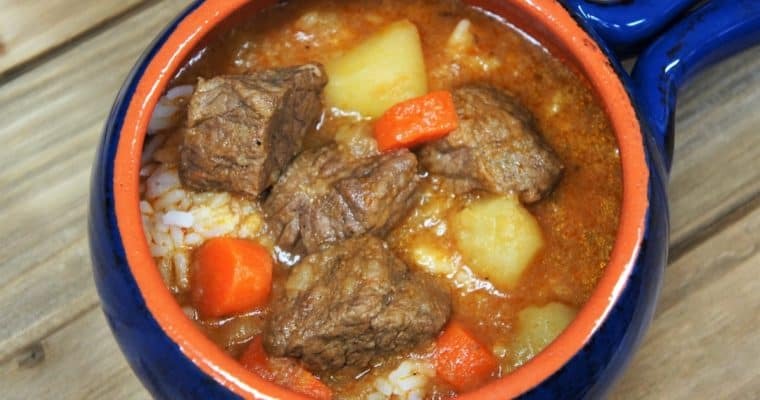 Bistec en Cazuela is a typical Cuban meal; and like many Cuban dishes, it’s not fancy – but it sure is good! Bistec en cazuela translates to steak in a pot, and that’s what it is, kind of. 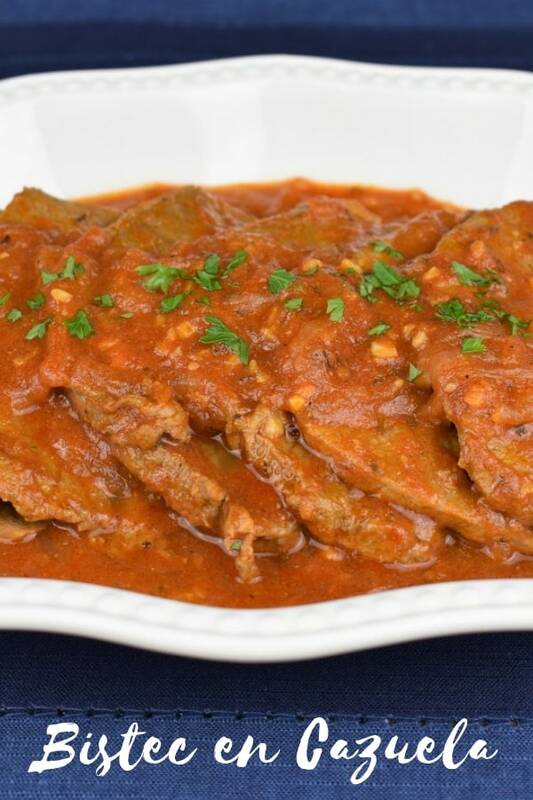 It’s thin steaks cooked in a flavorful tomato sauce with garlic and plenty of sliced onions. The steaks are cooked enough so that they become tender. Bistec en cazuela is typically served with white rice, add some fried sweet plantains or tostones, just for fun. 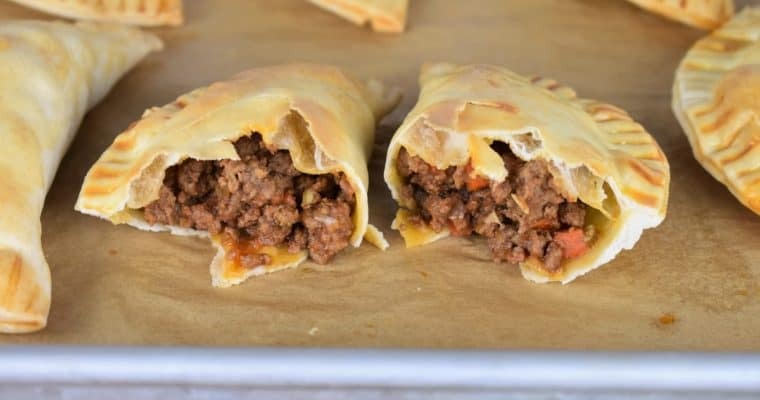 If you’re really short on time but still want a down-home Cuban meal, try this bistec de palomilla. It’s ready in just a few minutes and so good. Enjoy! In a small bowl combine the salt, garlic powder, dried oregano, cumin and black pepper. Cut the steaks in half to make 8 pieces. Sprinkle the steaks on both sides with the prepared seasoning mix. Heat the olive oil in a large, deep skillet or a large pot over medium-high heat. As soon as the oil is hot (but not smoking) add the steaks. Cook the steaks for 30 seconds to 1 minute per side, cook just enough to brown – do not cook all the way through. You may have to do this in batches. Repeat until all of the steaks are browned, set aside on a plate or pan. Keep the steaks warm. I like to place them in the microwave or oven, they stay warm away from drafts, or tent the plate with a piece of aluminum foil. Remove the skillet from the heat (do not wash). Place the skillet back over medium-low heat and add the onions. Cook the onions, stirring frequently for 5 minutes until they start to soften. Add the garlic to the skillet and cook for 1 minute, stirring frequently. Deglaze the skillet with the white wine and cook for approximately 1-2 minutes until most of the liquid has evaporated, stirring frequently. Next, add the tomato sauce, water and the bay leaf to the skillet, raise the heat to medium and bring the liquid to a simmer. 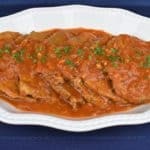 Cover, lower the heat to medium-low and cook the tomato sauce at a simmer for 10 minutes, stirring occasionally. Keep the sauce at a simmer, if the liquid is boiling too vigorously lower the heat a bit. Finally, add the steaks to the sauce, including any juices collected on the plate. Arrange the steaks so that they’re covered with the sauce. Cover the pot and cook, simmering gently, for about 20-25 minutes until the steaks are very tender. Remove the bay leaf and discard. Bistec en Cazuela is quick and easy to make. It’s also budget friendly, you can really stretch a pound of steak. For this recipe we used eye round, but we’ve made it with top sirloin steak. It’s ok to use a cheaper cut of meat, just keep in mind that it may be necessary to cook the steaks longer for them to become tender. Check on them after the 15 minutes, then add more time as needed. If the sauce is thickening up, add a few tablespoons of water and stir. Also, if you’d like to skip the white wine, deglaze the pan with chicken broth. Bistec en cazuela translates to steak in a pot, and that’s what it is, kind of. 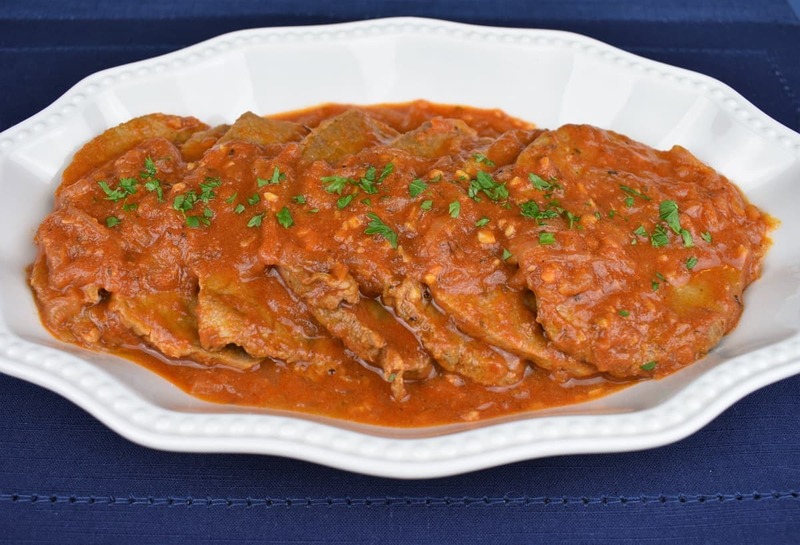 It's thin steaks cooked in a flavorful tomato sauce with garlic and plenty of sliced onions. Heat the olive oil in a large, deep skillet or a large pot over medium-high heat. As soon as the oil is hot (but not smoking) add the steaks. Cook the steaks for 30 seconds to 1 minute per side, cook just enough to brown – do not cook all the way through. You may have to do this in batches. Repeat until all of the steaks are browned. Add the garlic to the skillet and cook for 1 minute, stirring frequently. Deglaze the skillet with the white wine and cook for approximately 1-2 minutes until most of the liquid has evaporated, stirring frequently. Finally, add the steaks to the sauce, including any juices collected on the plate. Arrange the steaks so that they’re covered with the sauce. Cover the pot and cook, simmering gently, for about 20-25 minutes until the steaks are tender. Remove the bay leaf and discard.